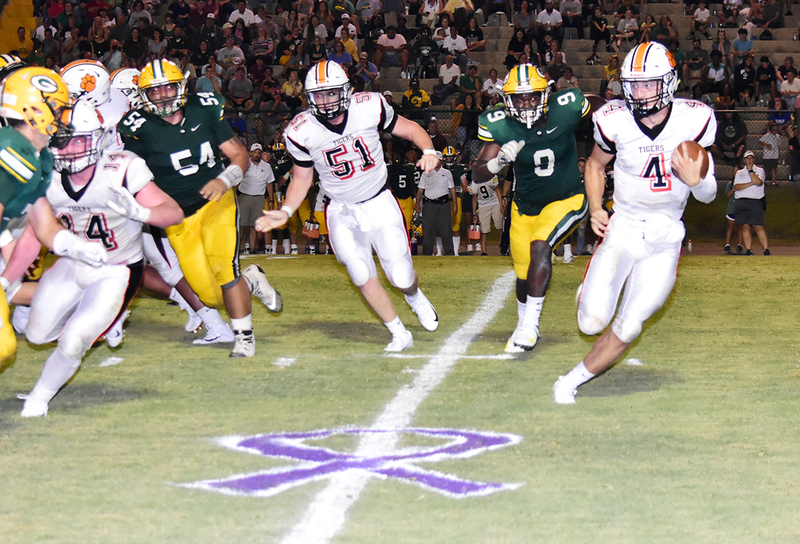 Fayette quarterback Blake Wallace (4) rolls out for yardage against Gordo as Zack Ingle (14) and Jackson Doran (51) block. For the second straight year, the FayetteTigers completed a touchdown pass with little time remaining on the clock to defeat the Gordo Greenwave. Fayette senior Blake Wallace, who was starting his first game as quarterback for Fayette, completed a 26-yard touchdown pass to Tre’Darion Walker with 4.7 seconds left on the clock to give Fayette a 19-13 victory.